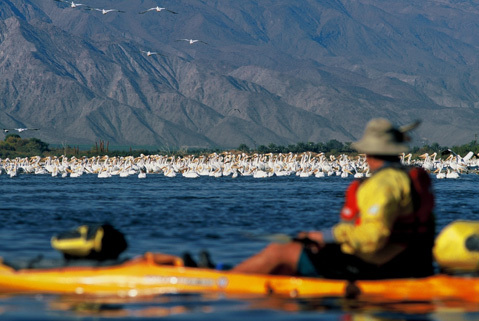 As my kayak sliced through the syrupy smooth Salton Sea, the only commotion on California’s largest lake was a massive flock of migrating American white pelicans plunging their long yellow beaks in the shallows, feasting in waters 25 percent saltier than the Pacific Ocean. I glided by them as they plunged and bathed their creamy white feathers in sharp contrast against the dark, murky waters. In my opinion, the Salton Sea gets a bad rap. I’ve kayaked around its 110 miles of briny shoreline on five occasions. I never got a whiff of any foul stench or witnessed any mass die-offs of birds in the southeastern corner of the state. Of course, all my trips were during the winter when desert temps are generally mild and the Salton Sea is brimming with birdlife. You can say what you want about the Golden State’s inland sea, but there’s no denying that the birds love it. Conveniently situated on the Pacific Flyway, the Salton Sea is a magnet for its diversity of birds and birders alike. More than a whopping 400 avian species have been recorded on the Salton Sea, surrounded by the Colorado Desert and vast agricultural lands. Eighty percent of the entire American white pelican population winters here, and 70 percent of California’s burrowing owl population thrives in this unique desert habitat, especially in and around the Sonny Bono Salton Sea National Wildlife Refuge. Previously known as the Salton Sink before massive flooding breached levees and dikes in 1905 and again in 1907, it wasn’t long before it became known as the Salton Sea. Over the years, a resort-like atmosphere ensued. With the likes of Hollywood elites such as Frank Sinatra, the Marx Brothers, and Jerry Lewis, the Salton Sea was becoming “the next Las Vegas.” At one point, it was receiving more visitors than Yosemite National Park. However, more flooding occurred, thwarting further development. Then, over decades, the reverse happened, and the Salton Sea has gradually receded, especially in recent times. Eventually the Salton Sea lost its allure, but don’t tell the birds that depend on this quirky desert oasis, their great escape from the distant north.